We arrived in Munich just fine after the long trip. 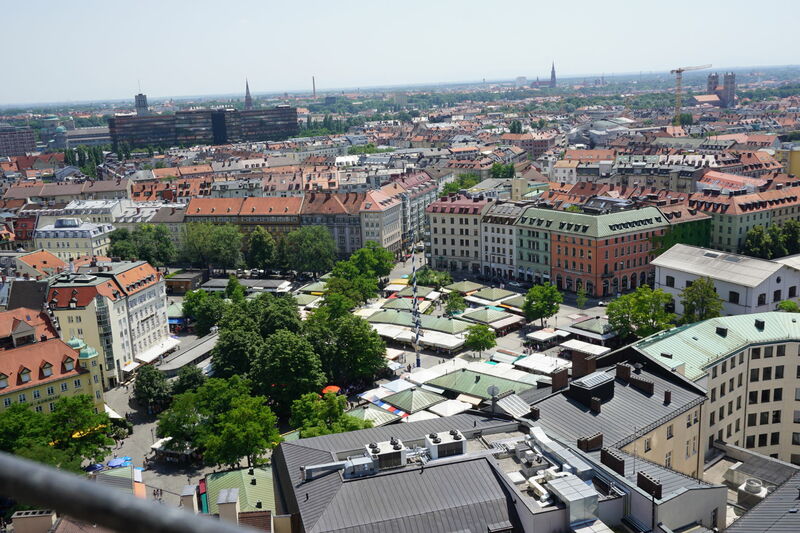 The S-Bahn is easy to navigate and our hotel is close to the main train station in Munich. 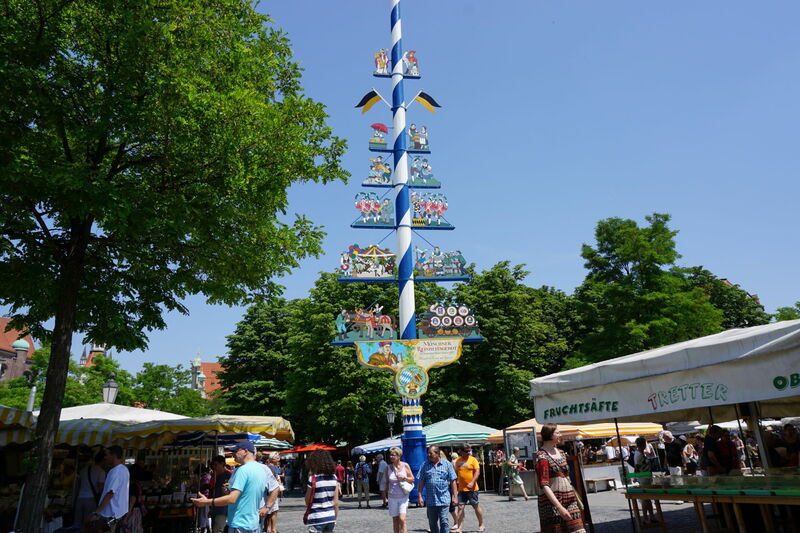 But, like most hotels, rooms are not ready early so we dropped our bags and began to explore Munich. Thankfully Bob can read a map and navigate because my sense of direction is frequently off. 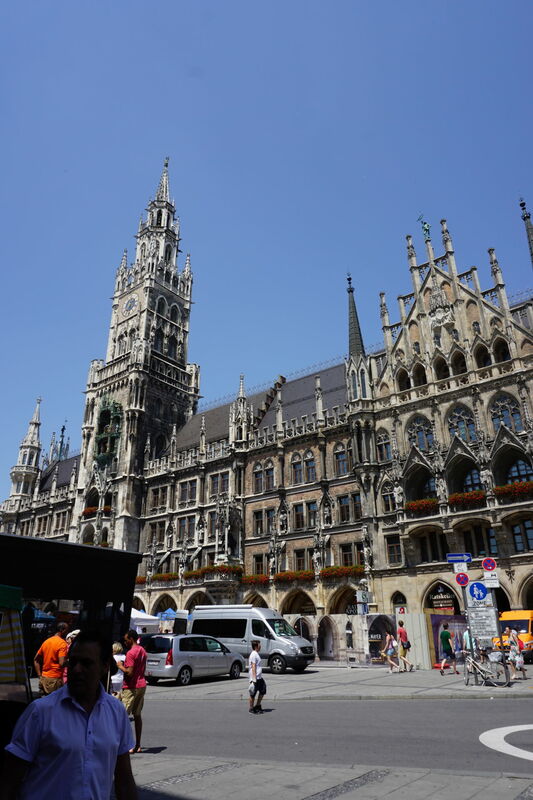 We wandered down to the Marienplatz and got our bearings. We had just a few things that we wanted to do this first day – find the market, go up into St. Peter’s Church and maybe walk up to the English Garden. Of course we get to Germany at the start of a heatwave, but we go for it any way. The Viktualienmarkt is huge. There is every kind of vegetable, pastries, food and beer available. We wandered through (I was looking for a chocolate shop) but it was so crowded and hot that we didn’t stop anywhere. We might go back, but for this day, we decided just to look around. 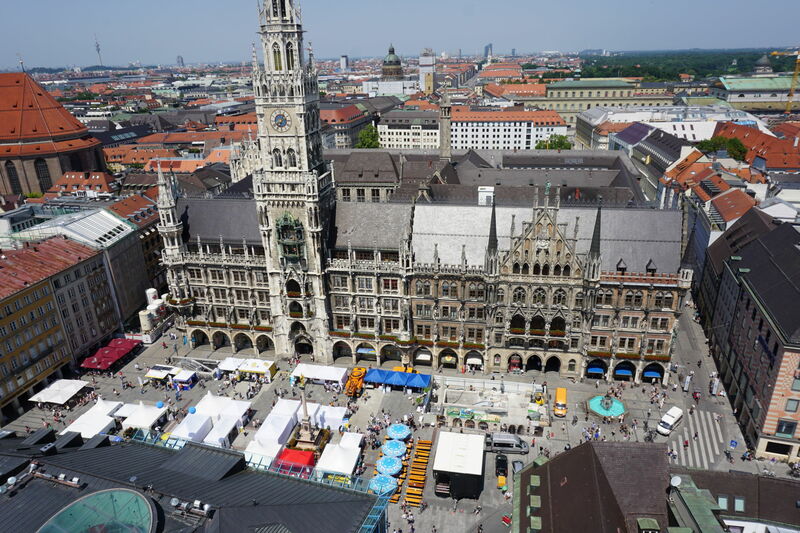 From the market we went to the Marienplatz. Again, it was very crowded, but we were able to find something to snack on as we watched the people. 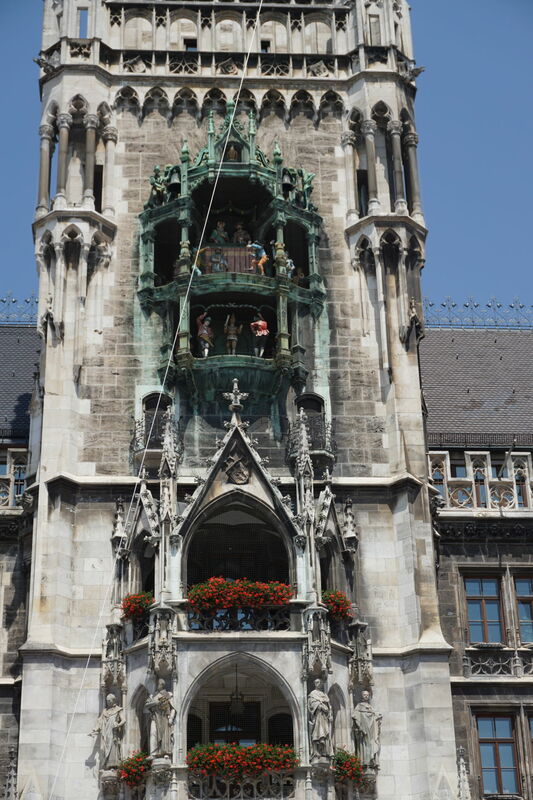 We also saw the Glockenspiel. This is a pretty impressive cuckoo clock. It is huge and there are two separate “shows” that play at certain times. We missed the eleven am show and it was too early for the five. After snacking so we would make it to dinner, we headed to St. Peter’s Church. I wanted to start here because I wanted to get an over view of Munich. 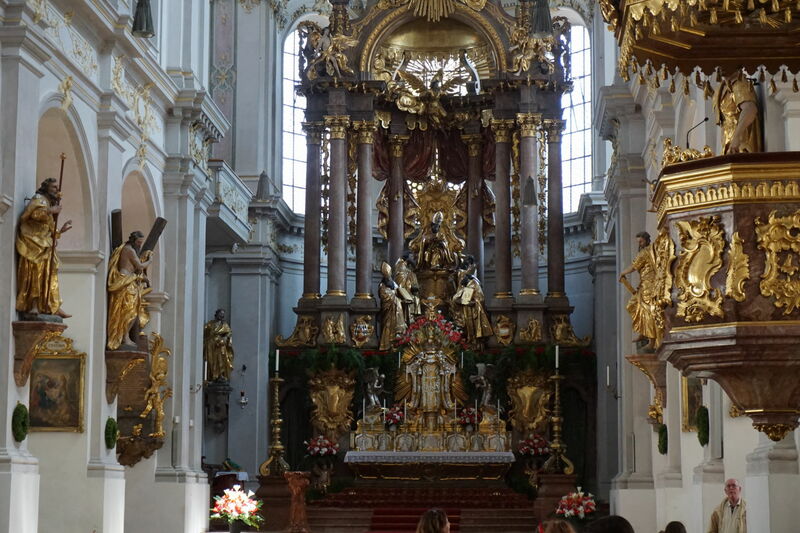 The church itself is one of the oldest in Munich, originally built in the 1100s. It was almost destroyed in WW2, but it was rebuilt in the old style and is pretty impressive. We climbed the 306 steps to the top and took in the views of the city. 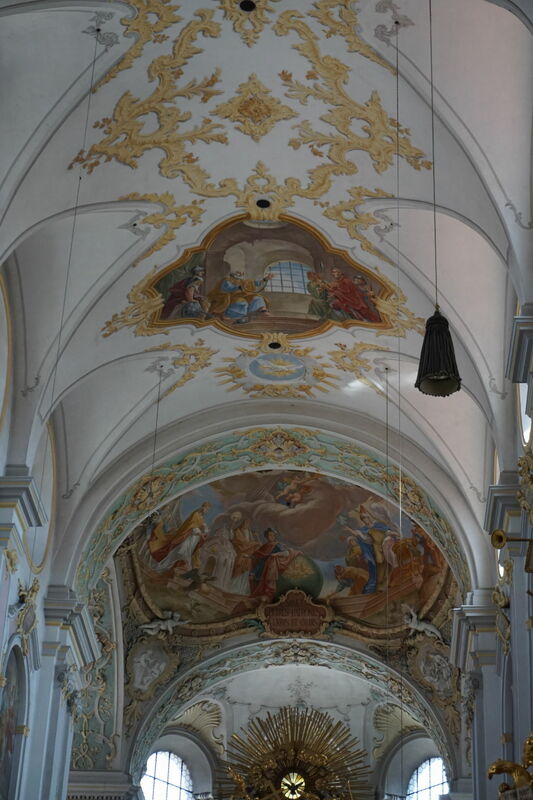 I was prepared to be impressed by the views, but I think I was more impressed by the interior of the church. This church is just beautiful. It is a different beauty than the Cathedral at Sienna, but very impressive still. I also loved the real wax candles. We decided, despite the heat (it was about 93 degrees) to walk up to the English Gardens. This is essentially a huge city park with lots of shade and various activities. There was a cricket match going on, children playing in the play grounds, lots of people resting under the trees, some swimmers and something we didn’t expect to see – surfers. 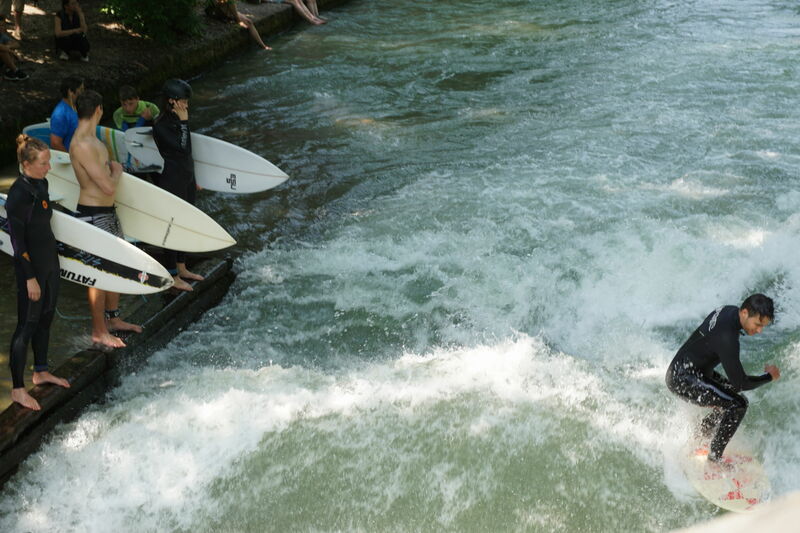 Yes, in the middle of the river in Munich, Germany is a wave pool area for surfing. It was definitely a site. We also saw lots of teenagers floating or swimming down river, getting out near a tram stop and taking the tram back to where they could do it all again. We know they took the tram because that is what we used to head back to the hotel as we needed to rest and clean up before dinner. All in all. It was a great start to the trip.